Antoine Van Schooten was recently appointed CMO of Industry and Digitalisation for ArcelorMittal Europe – Flat Products. 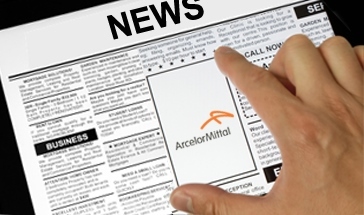 Read his opinion on what digitalisation means for ArcelorMittal as a supplier, and for our customers. ArcelorMittal’s range of press hardenable steels (PHS) already offer automotive designers a unique opportunity to create lighter and stronger solutions. But the introduction of two new products – Usibor® 2000 and Ductibor® 1000 – will allow OEMs even greater scope to lighten their vehicle fleet. And when combined into a single laser welded blank (LWB), they can even generate additional cost-effective and lightweight solutions. Together with Chilean manufacturer Tecnovial, ArcelorMittal’s Global R&D division has recently completed the development of a road safety barrier. The new barrier utilises high strength steel from ArcelorMittal and our unique Magnelis® coating to provide durable solutions for Chile’s roads. Discover QT-1400, a high strength coiled tube for oil and gas applications. It is the most advanced and strongest solution on the market today, brought to you by Quality Tubing and ArcelorMittal Europe – Flat Products. Find out how the use of Indaten® weathering steel makes a significant contribution to the appearance of a multi-functional education complex in the north of France, called Pôle Molière. ArcelorMittal presents the 0.18 mm Steel for Beverage Can and wins Bronze in The Canmaker's Award Sustainability Category. This new can enables canmakers to reduce the thickness of a beverage can without affecting mechanical performance.